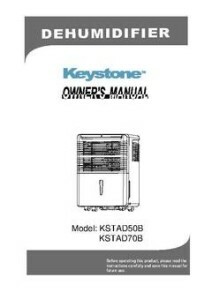 Keystone - KSTAD50B: Dehumidifier Review • The Air Geeks, reviews of air conditioners, dehumidifiers and air purifiers. The environment of your house can be ruined by excess moisture. Apart from affecting your breathing, excess moisture creates an optimum environment for the growth of mold and mildew. It also creates a suitable environment for bacteria and disease causing microorganisms. To reverse these effects, you should regulate the humidity of your room to suitable levels. A dehumidifier is designed and optimized for this purpose. The KSTAD50B is a portable dehumidifier that is designed to effectively eliminate excess moisture from the air. This unit is capable of removing up to 50 pints of moisture from the air in a day. If you have been having difficulties while breathing or your house has mold, then you need to get a humidity control system. In case your room is small or medium-sized, then this unit is designed to suit your needs. Let us see what the real deal is with the Keystone KSTAD50B. The KSTAD50B is a strong dehumidifier that is designed for spaces that are as large as 3000 sq. ft. According to the manufacturer, this unit is capable of removing up to 50 pints of water in a day. It effectively removes excess moisture to make your room free from mold and mildew. You should not let excess moisture to damage your valuables. This dehumidifier is optimized to maintain the humidity of your room within a desired level. You should always consider the power requirements of an appliance before you purchase one. The KSTAD50B is an Energy Rated dehumidifier and it is designed to perform optimally while consuming minimum energy.This dehumidifier is designed to consume 520 Watts at 4.7 A.. With its high efficiency, it is designed to help you save money. If you are not always available to empty the tank when it is full, then you should consider using the continuous drain option. This option requires a user to get a standard garden hose. The hose allows the unit to drain the accumulated water into an external reservoir or outside. This connection prevents auto shut-offs. However, replacing the bucket on the KSTAD50B has proved less than a pleasant experience, as the catch bucket has no top plate (it is open) : spills are difficult to avoid when you empty the tank, which is a problem. Yet, it is easy enough to operate and control the KSTAD50B. It features an easy-to-use electronic control with an intuitive LED display. In addition, it features a 24-hour timer that allows the user to pre-program when the systems starts and stops. Furthermore, the KSTAD50B features a water level indicator that enables the user to monitor the amount of water collected in the reservoir with ease. In case the tank is full, this unit is designed to alert the user before going off automatically. This helps to prevent water spillage on the floor. On the plus side, this unit comes with a 7.22 ft cord and the smart auto-restart feature, that enables the system to restart automatically after a power outage. The system auto-saves the settings and the user therefore does not need to reset the system after a power outage. What is more, this unit offers three different settings: Auto-Defrost, Normal, and Turbo. On the minus side, and while the KSTAD50B was designed to run quietly (according to the manufacturer, the system has a noise level of 55 dBA), experience has proven that is is significantly louder than its competitors, especially when the compressor is on. For us at the Air Geeks, this is a less-than-pleasant feature. Easy to operate and smart. 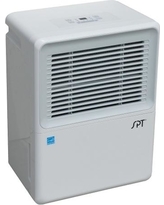 One of the most user-friendly dehumidifier in the market. Its intuitive user interface allows you to adjust settings with ease. Highly effective. When employed in a small room, this unit delivers impressive performance. It effectively pulls moisture from the air to make your room a comfortable place that is free from dumpiness and mustiness. Loud operation. This unit is louder than it should be. While the noise produced is less disturbing as compared to what some other dehumidifiers produce (air blowing), this is still a significant drawback. Generates heat. If it is left running for long, it can cause the temperature to rise by a few degrees. I love this dehumidifier. This is my fourth brand dehumidifier in 3 years. The first was a fire hazard recall, the second brand leaked the gas out of the compressor the first winter storage and the third just quit working after 2 months. It goes as they say : The Best if worth waiting for. Keystone is very QUIET compared to the other brands. Keystone is Energy Star rated and actually programmed to shut off the fan when it is not needed during the cycle process. The output vent is on the side versus the top but that doesn't matter to me. EASY to program/use. I don't know who actually manufactures this brand versus the others but they should all learn from this model. I do recommend 48 hours after delivery not to turn it on and just let it stand upright to allow the compressor gas/oil to adjust as needed - I don'[t know why they don't have on the box : KEEP UPRIGHT with arrows for shipping and don't understand why at stores you will see them stocked on their side or even upside down!" This is the third dehumidifier in the past 8 years for our basement. The first one crapped out after about 6 years, and the second one had a safety recall on it as it could cause a fire. Both of those were "name brands" and quite noisy. Got this Keystone 50-pint and it is by FAR the quietest of the bunch. Also, I ran a test and I calculated 48 pints of water per day - pretty dang close to the spec of 50-pint. Very pleased given performance vs price." While a our reviewers have expressed satisfaction with its functionality and performance, the Keystone KSTAD50B dehumidifier is louder than they expected when operating at full speed. Too bad, because it is easy to use and highly portable. After considering the features and performance of this dehumidifier, we think it deserves a 2.5/5 rating.